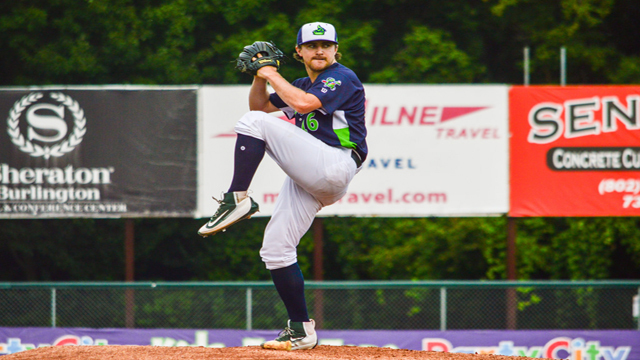 The Beloit Snappers (5-3) picked up their third-consecutive victory with a 9-6 win over the Kane County Cougars (3-5) Friday night at Northwestern Medicine Field. The Snappers used a five-run third inning, solid hitting, and a great start out of right-hander Wyatt Marks in route to Friday night's win. Marks was spotted a 1-0 lead before ever toed the rubber Friday night, as Logan Farrar roped his second triple of the season to center field, scoring Mickey McDonald who doubled earlier in the top of the first inning. With the double for McDonald, he extended his hitting streak to a team, season-high five games. During the streak, McDonald is hitting .529 (9-for-17) with a run scored, a double and an RBI. For the 22-year-old, his two-hit performance tonight marks his fifth multi-hit game in just seven games played for the Snappers this season. Marks yielded two unearned runs in the bottom of the first inning, as a fielding error kept the inning alive when it should have ended. The Cougars picked up the two runs on back-to-back RBI singles from Eudy Ramos and Ernie De La Trinidad scoring Yoel Yanqui and Ryan Grotjohn respectively. The right-hander Marks struck out a pair of batters in his first two innings of work on his way to a career-high nine punchouts. The former Louisiana-Lafayette product struck out the side in the fourth after surrendering a solo home run to Trinidad, and returned for the fifth inning to strike out two more to end his night with nine. Marks was given a ton of support by his offense in the top of the third inning, as the Snappers bats awoken for a five-run frame. Farrar began the scoring with a sacrifice fly to right field, scoring McDonald to tie the game at 2 at the time. Anthony Churlin drove home the go-ahead run with a RBI single scoring Austin Beck to give the Snappers a 3-2 lead. Jordan Devencenzi got in on the fun later in the inning, as the catcher singled home Churlin to double up the Cougars, 4-2, before Jake Lumley drove home a pair with a two-run triple to right field to give the Snappers a 6-2 lead after three. Marks gave way to Jesus Zambrano in the sixth inning, as Marks left with a 6-3 lead in hand. Zambrano found trouble early, as Eudy Ramos reached on a throwing error before Trinidad singled to advance Ramos to third with no outs in the inning. Zambrano composed himself for a moment and struck out Joey Rose to get the first out of the inning, before issuing a walk to Tim Susnara to load the bases for Yan Sanchez. Sanchez reached on a fielding error by right fielder Anthony Churlin, which also allowed Ramos to score to trim the Snappers lead to 6-4. Zambrano then walked in a run, giving the free pass to Jasrado Chisholm to narrow the Snappers lead to just a single run. The Snappers then plated a pair with two outs in the top of the seventh, as Jesus Lopez singled to center to get the two-out rally started. After back-to-back walks to Trace Loehr and Devencenzi, back-to-back wild pitches with Jake Lumley batting plated both Lopez and Loehr to up the Snappers lead to 8-5. Austin Beck added an insurance run in the top of the eighth inning, as he doubled home Nick Allen to give the Snappers a 9-5 lead heading to the ninth. After pitcthing a scoreless eighth inning, Heath Bowers returned to close the door in the ninth inning. Bowers yielded a lead-off home run to Chisholm, then promptly struck out the next two batters and got Ramos to ground out to second to end the game and preserve the 9-6 victory. All but two Snappers batters recorded a base hit, and only three did not come around to score. McDonald, Beck, Farrar, and Devencenzi each had multi-hit performances, with Beck and Devencenzi both contributing three hits while Farrar and Lumley both notched multi-RBI games. The series continues with game two of the three-game set Saturday afternoon at 1:00 p.m. at Northwestern Medicine Field. Xavier Altamirano (0-1, 5.79) will start for the Snappers, as right-hander Cole Stapler (0-1, 3.60) will start for the Cougars.